I missed this meme last week because we were hit by storm and electricity took 6 days to resume. I can't go to another place or town to do my posting because we have tons of cleaning up to do, makes my blogs my second priority then. We have to look for extra purified water, gas and decent food to eat as every store near us has been flooded too. Communication and network signals were bad and I had to go to Smart booth for the free call to my hubby's office to inform them of what happened to us. Anyway now we're returning to normal life and I'm posting my entry for this week. Luckily our plants and flower pots were not affected by the storm as our gumamela blooms suddenly after one week of storm. 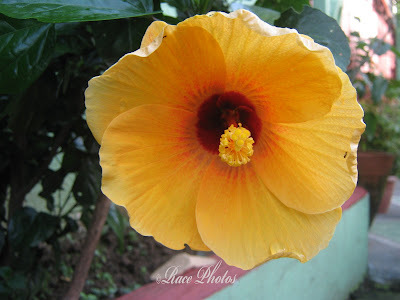 I've chosen this yellow hibiscus to represent the color of sunshine. God has sent the sun to give us message that there's hope after the storm. Hi Race, I am sorry to hear the problems you had with the storm but am so happy you and your family came through it okay. Thanks for sharing this lovely photo. How are u?I hope so u are ok.